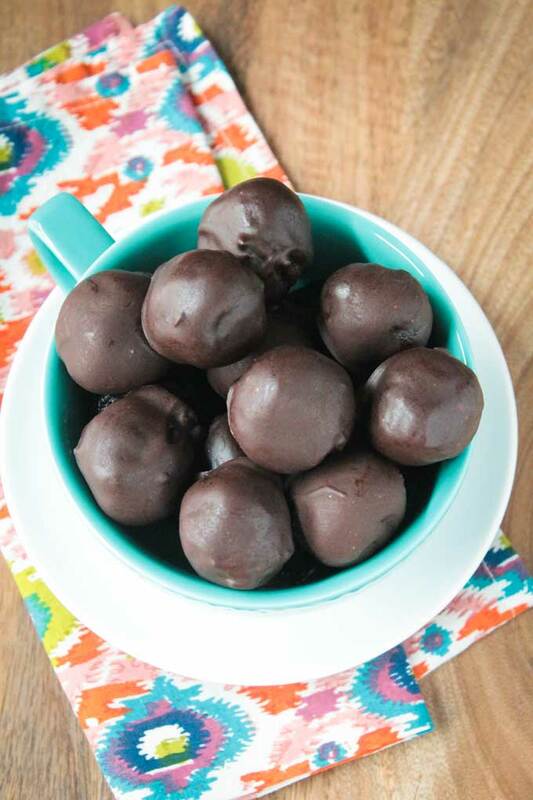 Cherry Chocolate Walnut Truffles – the perfect little healthy bite to tame that sweet tooth and keep hunger at bay. Afternoon slump got you down? Usually in those moments of weakness we reach for a sweet treat or a salty snack that is in no way going to boost our energy, and will most likely make us feel even worse. Well, now you’re in luck! 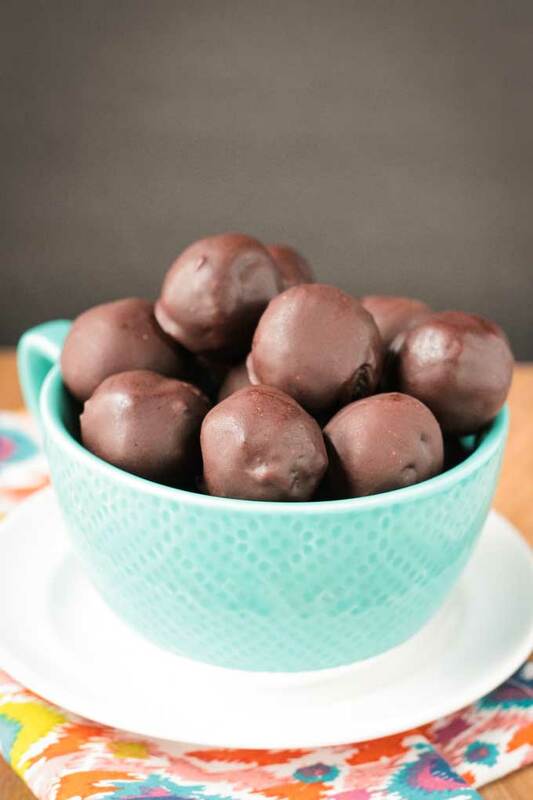 These Cherry Chocolate Walnut Truffles are made from real whole food ingredients! Enough sweetness to satisfy, but with protein, fiber, healthy fats, vitamins and minerals too! And only 5 ingredients needed (6 if you count salt). This recipe makes 2 dozen – keep them in your freezer and pop one in your mouth whenever you feel that sweet tooth taking over. I coated these in chocolate to make them even more indulgent, but they are fabulous even without the chocolate coating. You could even top them with crushed nuts/seeds or mini chocolate chips if you want. Sprinkle on any toppings while the chocolate coating is still warm. I didn’t get fancy with these. With three kids usually running wild while I cook, I don’t generally have time for fancy toppings. 🙂 So, while these might not be as Pinterest-pretty as some other truffles you might find out there, trust me they are just as delicious! Super Fudgy – Just Three Ingredients! The inside is super fudgy and, even straight from the freezer, is super soft. Can you believe only 3 ingredients create this amazing texture? Yep, just walnuts, dried cherries and unsweetened cocoa powder. No added sugar, no oil, no flour! If you can stop at just one, I applaud you. These have become somewhat of an addiction around here. So easy to make! 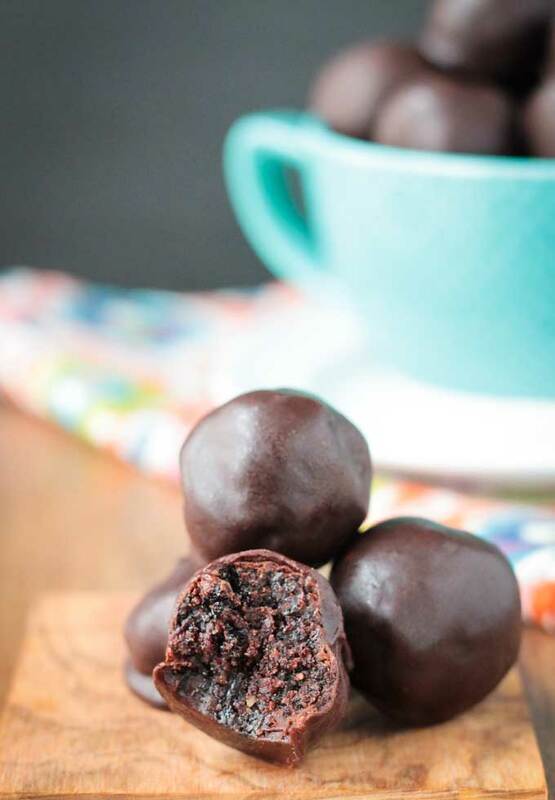 And since they are dairy free, gluten free, oil free, and refined sugar free, go ahead and eat a couple of these delicious Cherry Chocolate Truffles! If you try them, please come back and leave me a comment below with your feedback and star rating. 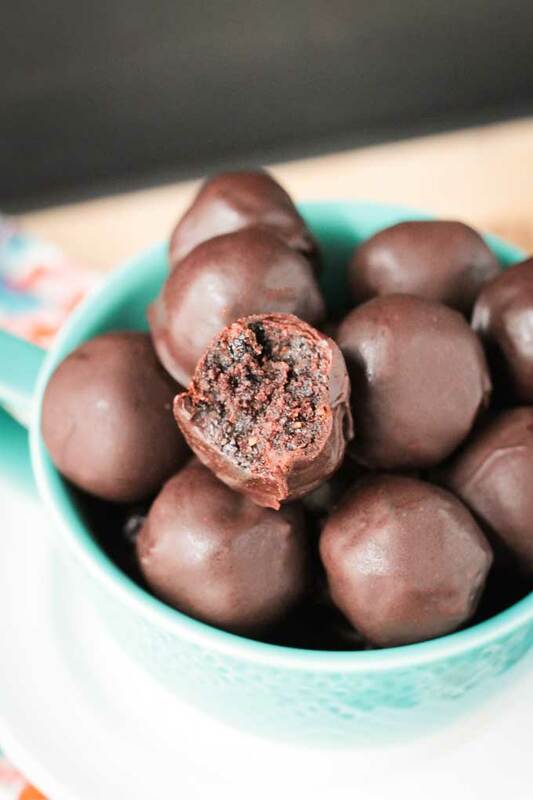 These Cherry Chocolate Walnut Truffles are the perfect healthy, fudgy bite to tame your sweet tooth and keep hunger at bay. Line a baking sheet or large plate with parchment paper and set aside. Place the walnuts in the bowl of a food processor and pulse until the consistency of a fine crumb. Add the cocoa powder and salt and pulse a few times to combine. Drain the dried cherries and add them to the food processor. Process until the dough starts to come together in one big sticky ball. Form into balls by taking 1-2 tbsp at a time and rolling it in the palm of your hand. Place them on the prepared baking sheet or plate and place in the freezer for about 20-30 minutes. In a small pot over low heat, add the chocolate chips and dairy free milk. Stir constantly until smooth. This will only take a few minutes - do not walk away or it will burn. If you want it a bit thinner, add another tbsp of dairy free milk until desired consistency is reached. Turn off the heat. Take the truffles out of the freezer and dip them in the chocolate (1-2 at a time), turning them so they are coated evenly. Using a fork lift them out of the chocolate and place back on the baking sheet or plate. Place back in the freezer to set. Enjoy them straight out of the freezer! Place any leftovers in a freezer safe container or bag (make sure they are completely cold first so they don't stick together). Want more dairy free chocolate? Made these to give as Valentine’s gifts, and I LOVE them! They’re absolutely delicious and I love how healthy they are. I really wanted to give treats that were indulgent but weren’t just pure refined sugar/saturated fat, and I wanted something my vegan friends and gluten-free friends could enjoy. These fit the bill perfectly! That’s so great to hear, Caitlin! Thank you! Isn’t it amazing how just a few simple ingredients can taste so indulgent? Thanks for making my day with your great feedback! Enjoy! These truffles look amazing, Jenn! Thanks, Amy! And they are so easy! Believe it or not, I did exact the same procedure( non- vegan) with raisins and chocolate for my blog! In 2 weeks am posting it:) this totally awesome! Raisins sound great too! Thanks, Uma! These look so delicious. One of my favorite food combinations is chocolate and cherry. Maybe even more than chocolate and peanut butter. Oh, perfect!! I hope you love these! Thanks so much, Nicole! Oh my gosh, I need these in my liiiiife! My favorite combo. These sound as if they are no-fail too. Thanks so much! I love truffles. These look sooo delicious, I can’t wait to try this recipe! Thanks, Sam! I hope you love it! I don’t like most candy with cherries – but the dried cherries are another story. Lovely. You have put a bit of thought into this in terms of the ingredients you have chosen. I like that they are made from real ingredients. Nice pictures. Thank you, Mark! I appreciate that! Have a great weekend! I love truffles of all kind. Such a delicious treat! Thanks, Ilona! Have a great weekend! Oh my word these look great! Chocolate and cherry are such a classic combination of flavors because they simply work so well together! This will be awesome for Mother’s Day treats! Ooh, yes, I would certainly be happy to have these for Mother’s Day! Thanks, Debi! Oh I love truffles, one of my favorite desserts! I love cherry and chocolate together too, such a classic combo! These look so rich and delicious! Sooo chocolatey, I’d love a whole batch please! Love that photo of the bite! Thanks, Brandi! Cherry and chocolate are so fabulous together! And I wanted to do something different than dates. I love dates, but it seems all plant based truffles are made that way and I wanted to try something a bit different. Luckily, they didn’t need any extra sweetness! Cherry chocolate BOMBs! Ahhhh! I always love the photos of bites and truffles…seriously always mouth watering!! Or maybe it’s just always the chocolate? Hahaha! Either way, Loving it! Well, chocolate does pretty much make everything better and more beautiful. 🙂 Thanks, Rebecca!